The Botanical Garden's LuEsther T. Mertz Library is named for its largest benefactor, the genius behind the concept of the mass market mailing of multiple magazine subscription offers. Founded in 1953 by former librarian Mertz, her husband, and their daughter, Publisher's Clearing House became the largest and most profitable magazine circulation agency in the world. (And this even before the savvy stealing of the sweepstakes stunt from Reader's Digest in 1967.) But despite being one of the few librarians ever to end up a multimillionaire, LuEsther Mertz never forgot her former profession. 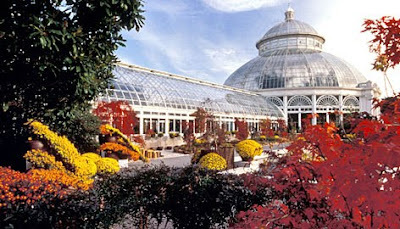 Her charitable trust benefits the New York Botanical Garden's many programs, including the unique library that bears her name. The library houses one of the world's foremost collections of materials on botany and horticulture. Cataloged items number over one million, including books, journals, seed and nursery catalogs, original works of art, photographs, and architectural plans. The holdings cover the literature, art, science, history, and lore of the plant kingdom from the 12th century to the present day. 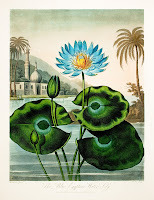 The Ex Libris exhibit will continue through January 10, 2010 at the New York Botanical Gardens in the Bronx. For those unable to savor a sample of the Big Apple's produce, a checklist for the exhibit, including images worthy of a state fair prize, is available. Visiting the library that owes its bountiful harvest to Publisher's Clearing House will no doubt prove more fruitful than subscribing to two dozen magazines and hoping for a bouquet from the Prize Patrol.